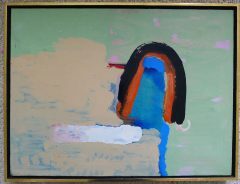 He worked in the printmaking department of the Royal College for 35 years (1955-90), acting as Head of Department 1970-1990 and as Professor of Printmaking (Emeritus} 1984-1990. He insisted that all the teaching staff should be practising artists. Grant also had a strong entrepreneurial streak. In the Eighties he initiated the Royal College’s Printmaking Appeal Fund which published two of the most important print portfolios of the last few decades in order to raise funds for the printmaking students. 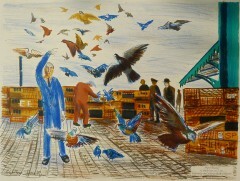 Over the years he taught printmaking to many who were to become leading UK artists.